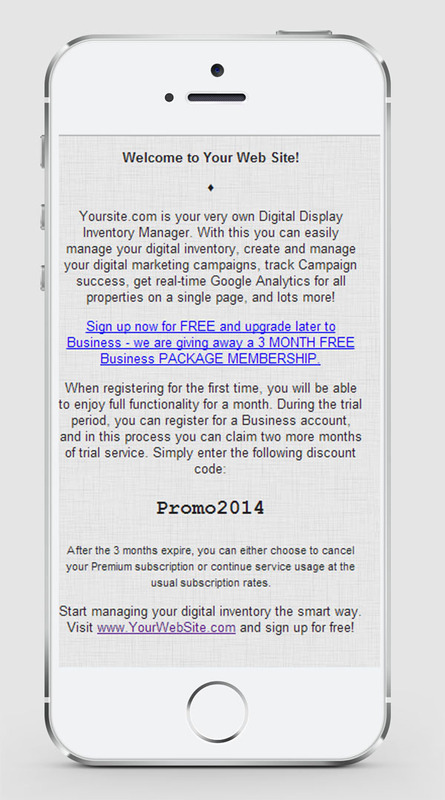 Our web site is an online service that enables you to generate QR codes for free. Many times we needed QR codes for our clients, and all services lacked one or another feature. Our company provides IT services and products from 2004 and strongly believes in service excellence – that was the main reason for developing codeQRcode.com for easy generation of QR codes. It is a type of two dimensional matrix code, abbreviated from Quick Response code. Originally it was created by Toyota subsidiary Denso Wave in 1994. It became widely popular with new applications for scanning QR codes with mobile phones and smartphones. QR codes can contain Numeric data, Alphanumeric or binary data. Along with useful data, QR code contains also error correction data that enables to restore from 7% to 30% of user data. This mechanism helps preserving data and improves reading speed and success ratio. What is a dynamic QR code? Why do I need redirection? There are many reasons to use dynamic QR codes instead of classical static QR codes. 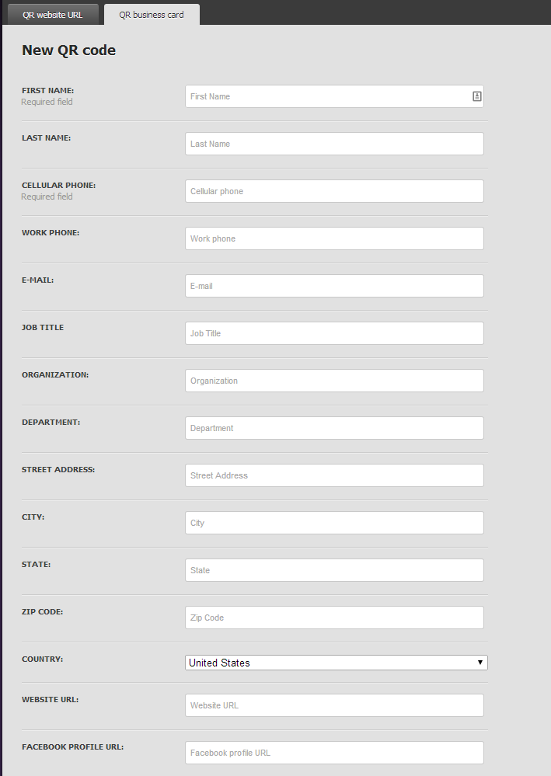 In more than 50% use cases you will need to change destination address (URL) sooner or later, contact data (QR codes for business card with vCard files). As a free subscribed user at codeQRcode, you can do that in a matter of seconds! There is no need to reprint QR codes or redistribute/update them. Another, very important benefit of dynamic QR codes is the ability to track down and count the scanning of your QR codes. 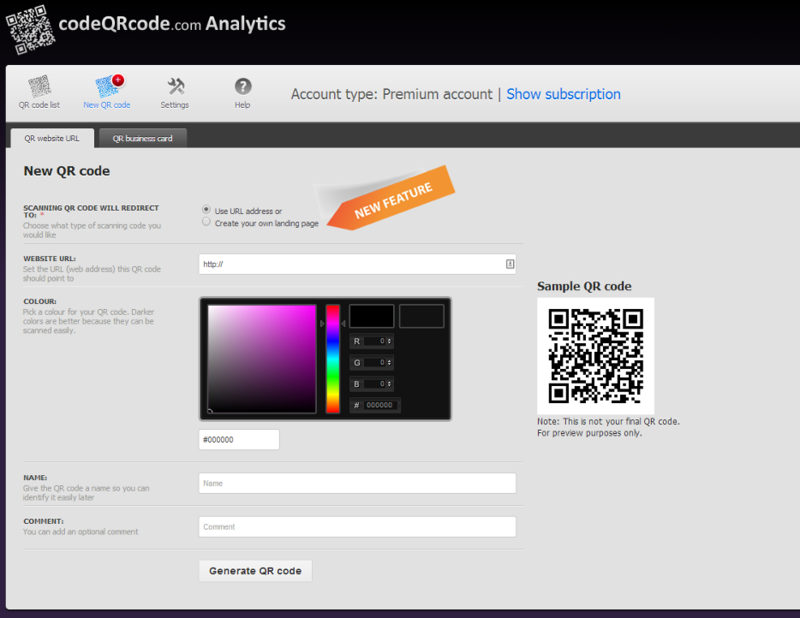 codeQRcode.com provides every dynamic QR codes you generate with detailed Analytics. What information can I get with dynamic QR codes? 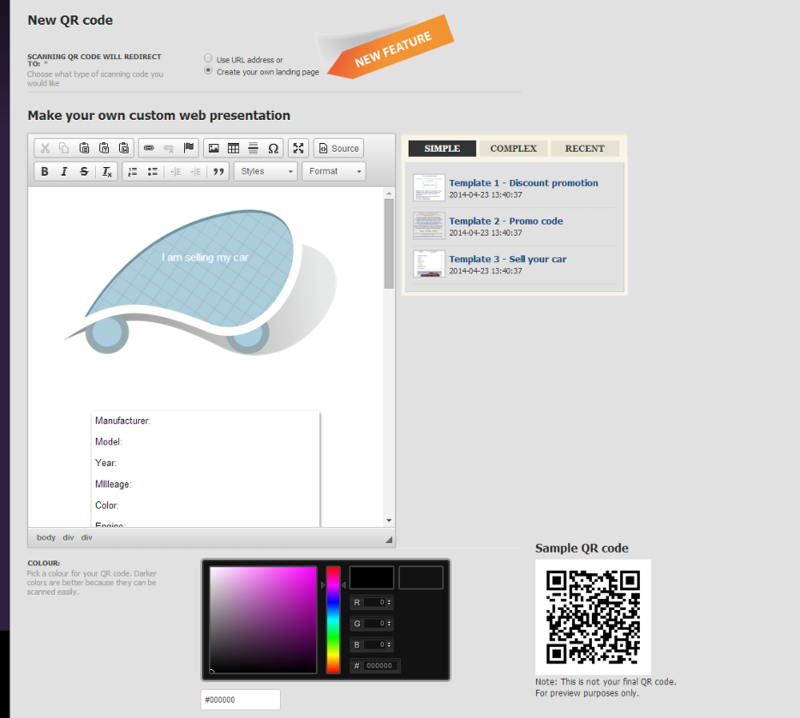 With codeQRcode.com enables you to measure the success of your QR codes. You will know how many times every QR code is scanned, on which date (number of scans per each day), what devices are used to scan your QR code (Android, iPhone, Blackberry etc...). How many scans are unique and how many are returning visitors? 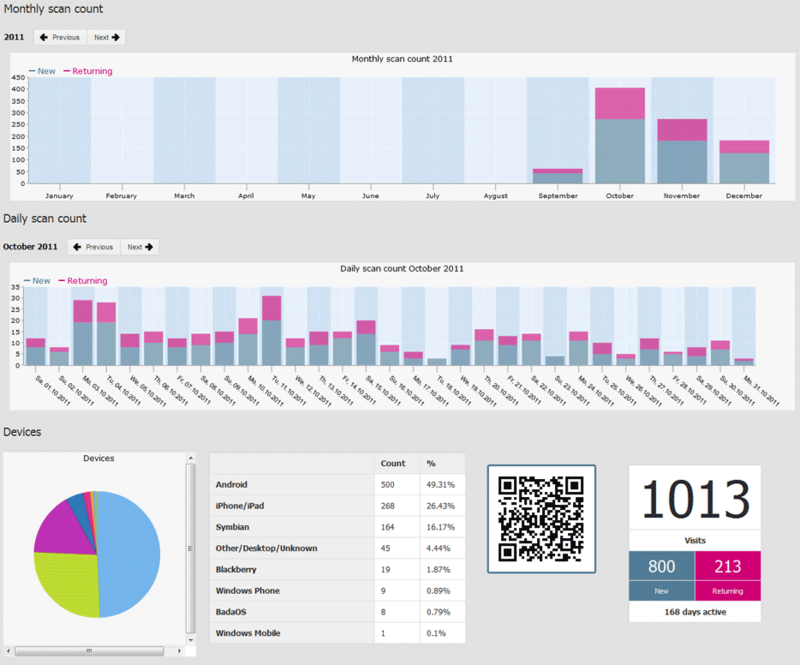 All QR code statistics are available for registered users via our Analytics platform. How can I change QR code data? Any time when you your destination URL (web address) changes, if you are using dynamic QR codes, it is easy to change destination URL as many times you want. Even more, if your contact data is changed, new company, new phone or address, all contact data that links from QR code can be easily updated in matter of seconds. The QR code itself remains the same, it is not necessary to print it or apply it again on your web site or business card. How to print QR codes? What about high resolution QR codes? If you need professional looking QR codes, or if you are preparing print / BTL campaign high-resolution QR codes are mandatory! For Premium subscribers, each generated QR code is available as a PNG, hi-resolution PNG and even in vector format (PDF). It depends on what device / mobile phone / smartphone you have. Some of them already have a QR code scanner preinstalled (like some Nokia devices). For Android devices, you can use our QR code scanner app available here for free! If you have a Nokia device and do not have a QR reader application preinstalled, just click here to download one. For your Blackberry (RIM) you can find a QR scanner app here. Do I need any license for QR code generation or QR code scanning? QR code is defined as an ISO standard in public domain. Use of QR codes is free from any licenses.